As a client of Hotel Roma, you are entitled to a 15% discount off all selected treaments you choose to have inside the TERME DI CASCIANA. 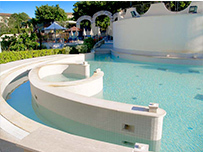 You are also entitled to a reduction on the entrance ticket to the external thermal swimming pool. and made noteworthy by the legendary story of a blackbird that was healed by the waters. The spring is considered one of the healthiest in all of Italy. Studied and analyzed by illustrious doctors and chemists for the waters’ exceptional therapeutic properties, the quality of the water can be thanked for Casciana’s awarding of the noble insignia of the “Perla Termale d’Italia”. The springs’ waters flow from their source at about 35,7°C. Type of mineral water: Sodic-Chloride, Calcic-Carbonate, Magnesium sulphate, Silica, Aluminum, gaseous carbon. 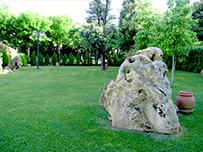 The source of the water is within the thermal park and its origins were first discovered in 1824; the waters’ chemical composition renders it different from the other springs. Because the spring was enclosed within a well in the thermal park, it was thought that it was the natural water used for the cooling of the baths, that is, the origin of the “well”. The water flows out of the source at around 24°C and is particularly indicated in hydropathical therapies. At the Casciana Thermal Baths the bathing areas are continually replenished with a river of thermal waters, allowing one to enjoy a sense of wellbeing directly from the source. Between 6 and 10 million litres of thermal water run through the baths daily providing a richness of minerals that arrive in depth, giving relief and aiding in relaxation. 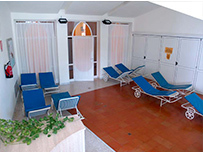 This continuous and abundant change of water assures that any immersion is fully effective, both in the pools and in the Jacuzzis that the Centre provides. For centuries the fame of Casciana Thermal Baths has continually grown thanks to the waters of the Mathelda spring that, it is even said, have anti-aging properties. Today we have scientific proof that the water’s miraculous composition of natural elements is able to regenerate, reactivate and rehabilitate. Its bicarbonate-sodic gaseous carbonate composition has therapeutic properties, and is particularly indicated in cures regarding venal circulation disorders, rheumatism and arthritis, hyperuricaemia, high cholesterol, rhinitis, pharyngitis, bronchitis and all types of gynecological ailments. For these particular ailments our hydro-massage is a thermal technique that consists in a 20 minute immersion in a tub filled with 36° c thermal water rich with carbon dioxide, aiding in peripheral vasodilatation and venal circulation. This therapy is particularly indicated for those who suffer from chronic venal insufficiency, post-phlebica syndrome, varicose and capillary veins and venal stagnation with peripheral edema. 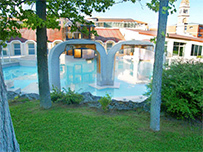 The waters of the Casciana Thermal Baths are particularly indicated for sciatic pain. Our irrigation treatments are useful for all types of gynecological ailments in that they help to restore the vaginal pH through an osmotic equilibrium of the electrolyte membrane. Mud constitutes a quick and valid cure. It consists of the application of a thermal mud (clay plus thermal water) at about 45-50°, applied on the articulations in need of treatment for around 20 minutes, after which follows a thermal bath in 36° water for 10 minutes. The treatment is useful for those who suffer from chronic rheumatism, whose variations of arthritis in diverse locations, gout syndrome, and ailments caused by trauma and surgery. The waters are especially useful in treating both food related and medicinal hepatic toxicosis and in treating dyskinesia in biliary paths as a result of the water’s hepatic-protective properties thanks to the presence of sulphate ions. The waters are also usefully in hyperuricaemia (gout) and cholesterolemia treatments. With aerosol, these waters are useful in treating all of the pathologies regarding the oropharyngeal cavity like sinusitis, pharyngitis, laryngitis, and tracheitis especially in infants, where treatment aids in an increment of immune system defense mechanisms. The treatment can be undertaken both nasally and orally using aerosol-therapy, and with warm, humid vapors (inhalations) especially indicated in treating pharyngitis and chronic laryngitis. Complete facial treatments with cleaning using vaporization to eliminate impurities, followed by the application of choice, based on the skin type, of a thermal mud facial mask, and finally a toning massage of the face, neck and bust. These are treatments that evoke intense sweating resulting in the elimination of toxic substances from the body. The modeling and reducing massages are aimed at several “critical” zones of the body where cellulite is more readily formed. This treatment includes a filiform shower with simultaneous four-hands massage using essential oils.